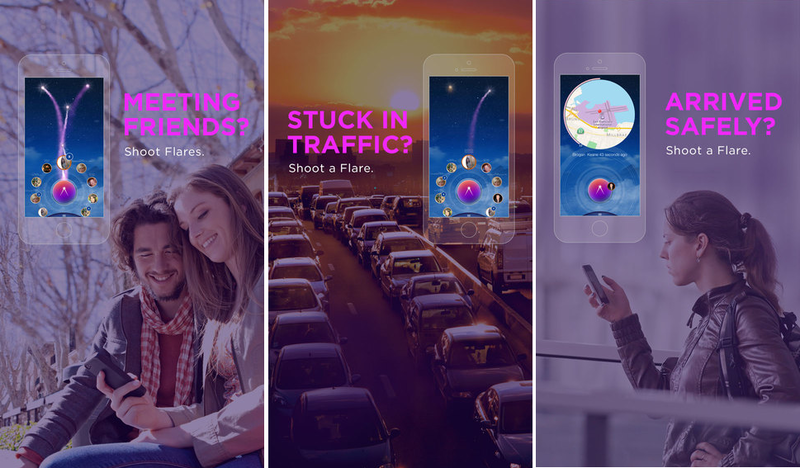 Flares, an app that allows users to quickly share their location in real-time, is now available to download for iPhone users in the US. While it’s described as a “mobile messaging service,” it’s not a messaging app in the traditional sense. Think of it like Yo for geolocation (or GeYolocation, as our Editor-in-Chief Martin Bryant put it). And if you’re wondering what that could be useful for, then its possibilities really are in your hands. Like Yo, it provides a simple messaging service; it’s up to you to provide the context. To use it, you just tap the button to create a message, select a recipient and then swipe the screen to send the flare up. Recipients then have 60 minutes to access that flare. The idea was to keep it super-simple so that it’s easy to use while you’re engaged in another activity, like running, driving, cycling etc. “Designed to be simpler, more convenient and safer than either texting or calling while on the go, Flares can be used to let a boss know you’re late and mired in traffic, a parent know that their daughter is safe while away or by groups of college friends trying to organize social meet ups,” the company said. Flares can be individual or group-based and provide the sender with notifications once the recipient has seen the flare, or indeed, if they never opened it at all. Unopened flares are accessible for an hour by default, but to ensure that the sender retains some privacy, flares can only be viewed on a map for 40 seconds before expiring. It’s more like a location ‘blip’ or check-in than continual sharing of location using something like Glympse. Brogan Keane, CEO & founder of FlareWorks, said that as a result of this temporary sharing, kids don’t seem to mind using it to let their parents know that they’re okay when they arrive at a destination. We’ve seen strong usage by parents, particularly moms, who use Flares to keep track of family member whereabouts at specific points in time. Teenagers aren’t as resistant to revealing their location for 40 seconds than they are allowing their parents to track them all the time. While Flares is walking the line somewhere between messaging and location sharing, Keane says that frequent comparisons to companies like Glympse or Taptalk or Whatsapp all miss the mark. “None of these really focus on changing the way people communicate on a global basis, across all cultures and socio-economic strata, in the same way that we have set out to do. Closer to the mark is a simple app like Yo,” he said. Of course, the key to Yo is the sender and receiver understanding the context of the message being sent. A Yo without context is pointless. There are no confirmed monetization plans for the service as it stands right now, but future options include in-app skins and customization (flare color, animations, emoticons, brands etc. ), premium plans for families who want advanced tracking capabilities and possibly even transaction-based revenues from local businesses, Keane explained. Local businesses (dry cleaner, pizza delivery, etc.) might tap into the flares mesh on a per transaction basis in order to communicate with a customer that their dry cleaning is ready for pickup, their pizza is on the way, etc. While a user isn’t likely to download a local dry cleaning app they would use Flares to communicate, ephemerally, with these businesses in order to receive a higher level of customer service. Then, of course, there’s always the option for in-app advertising based on location. For now, however, Keane wants to focus on growing the user base and availability around the world before worrying too much about making money. Our focus, not surprisingly, is on generating a global following for Flares across all smartphone devices and in all cultures before commencing our monetization efforts. Nonetheless, he says that knowing how you’re eventually going to make money right at the outset is key to providing a slick experience. Flares was designed, out of the gate, not just to look and feel elegant but to monetize in a way that no messaging app has ever done before. The key to making this happen is to design the product experience with monetization in mind at the outset and to focus on our visual messaging paradigm over a text-based one. While the launch is only for iOS devices, there is an Android version in the works. All FlareWorks has to hope now is that Yo doesn’t add a robust geo-location feature to its own app.